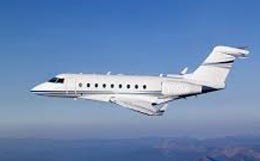 After the immense success of the Citation X, the Cessna Corporation decided to release a redesigned, improved private business jet: The Cessna Citation X+. 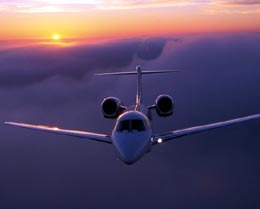 The Citation X+ holds the record for the fastest private business jet, capable of cruising at an impressive 0.935 Mach. Being both faster and capable of flying further than its predecessor, it is no wonder why the Citation X+ really took off in the private jet market. The luxury of the Citation X+ cannot be understated, with features such as a deluxe private lavatory, a deluxe galley, and hand finished details. 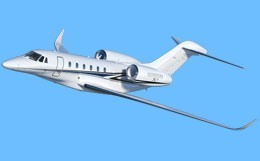 The Citation X+ is capable of accommodating a maximum of 12 passengers. 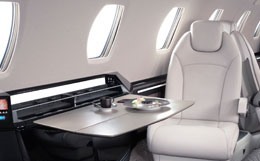 The cabin of the Citation X+ measures 25.167 feet in length, 5.5 feet in width, and 5.67 feet in height. With 104 cubic feet of baggage storage capable of accommodating 1,095 pounds of luggage, the Citation X+ offers more than enough space to meeting your luggage needs. The dramatic sweep of the wings in conjunction with the equipped winglets allow for the Citation X+’s impressive service ceiling and speeds while maintaining stability at low speeds. An APU is equipped for cabin cooling and engine start and hydraulically actuated thrust reversers are utilized for improved landing performance. The Citation X+ comes equipped with two dual channel FADEC controlled Rolls-Royce AE3007C2 turbofan engines. Each engine is rated at 7,034 pounds of thrust for static take off at sea level. 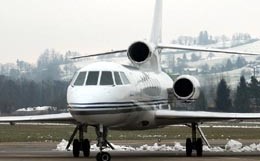 With these powerful engines, this private business jet requires only 5,250 feet of runway to take off and 3,330 feet of runway to land on a standard day. The Citation X+ features an impressive climb rate, capable of climbing 4,117 feet per minute and reaching 47,000 feet in just 24 minutes. The Cessna Citation X+ also features an impressive transcontinental range of 3,460 nautical miles, allowing for many destination options for your business venture. Additionally, the Citation X+ is the fastest private business jet on the market, capable of maintaining 528 knots in a cruise configuration. The Cessna Corporation selected the Garmin 5000 avionics suite for the Citation X+. Three 14 inch touchscreen landscape WXGA high-resolution displays can serve interchangeably as primary flight displays (PFDs) or multi-function displays (MFDs). The most common screen set up is the multi-pane configuration, where the middle pedestal acts as the MFD and the remaining two displays function as the PFDs. This advanced avionics suite utilizes Garmin’s Synthetic Vision Technology (SVT), which provides a virtual reality perspective of obstacles, traffic, and terrain even in Instrument Flight Rule (IFR) or night time Visual Flight Rule (VFR) conditions. Components of the Garmin 5000 avionics suite include an Attitude Heading Reference System (AHRS), distance measuring equipment, an automatic flight control system, flight management systems, integrated avionics units, Traffic Collision Avoidance System (TCAS II), Terrain Awareness Warning System (TAWS), a weather radar, transponders with ADS-B Out capability, a radar altimeter, an emergency locator transmitter, a cockpit voice recorder, standby instrumentation, and maintenance diagnostics. For more information about chartering, leasing or buying a Citation X+ please contact us by calling +44-20-3874-8091 or send us an email here.